I woke this morning to the sad news that Phife Dawg, founding member of A Tribe Called Quest had passed away. I hadn't really considered myself a big fan of ATCQ until this moment. I say that because outwardly I'm more vocal of other artists, but their influence on me is undeniable. Trailblazing and iconic are words often used to describe the group and their contribution to hip-hop. I was moved by the Rapaport documentary Beats, Rhymes & Life: The Travels of A Tribe Called Quest, and you can bet I'm able to rap along to every track on The Anthology. 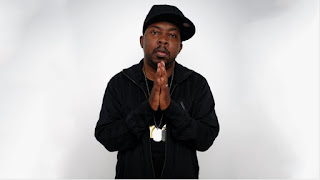 Our generation has lost another seminal talent, my thoughts and prayers go out to his family, friends and fans. I've been planning on writing a music post ever since Kanye West dropped (read: fumbled) The Life Of Pablo, but after all the attention that garnered I figured I'd keep building before saying my piece. In addition to that I was inspired by new music from Sturgill Simpson, two highly anticipated gigs coming in June and I got sent an unmixed demo to listen to where not only do I get a shout out, it's in the opening line of the track. This was completely unexpected and having come from an artist I respect immensely, unbelievably humbling. It's a lot to write about, so to keep it coherent I'll break it into a couple of posts. Here's part one. 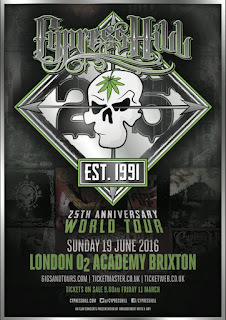 I went completamente loco when I found out that Cypress Hill are coming to London as part of their 25th Anniversary World Tour. I know they've had a number of festival dates in the UK in recent times but for whatever reason I'd not managed to see them headline a gig since the Brixton Academy in 1994, that's some 8,065 days ago the internet tells me. The excitement got the better of me and I ordered through my O2 Priority Ticket pass two days before they were to go on general sale. There are even VIP passes available that I am seriously considering. It has been reported that a new album entitled Elephants On Acid is close to being finished. Apparently B-Real and Sen have already done the lyrics and DJ Muggs is finishing the production, some of which he's teased via his Instagram. Would be good to hear some new material, but moreover I'd love for Muggs to be on stage with B, Sen and Bobo. I have a feeling he'll be busy and there will be a more than capable stand-in behind the decks, but we shall see. Having only just come down from the high of buying that ticket, I discovered that Jane's Addiction will be in London the very same week playing Ritual De Lo Habitual in full. Last year marked twenty-five years since it's release, but I forgive the band for being a little tardy with the anniversary gig. I was able to see them perform Nothing's Shocking a couple years ago, and with Ritual consisting of just nine songs they promise to play classics too which would make it a dream gig. I've seen them twice in London and they are one of very few acts I'd love to continue to see. Despite this I didn't pull the trigger on a ticket, I think mostly because I was likely to be going alone. Tickets are no longer available so the decision has been taken from me. Really gutted that I hesitated but I will keep my eyes and ears open for any tickets nearer the time. As a distraction Rolling Stone have an interesting song by song breakdown by Perry and Dave published here. After that disappointment I want to finish on a high note, that being new music by way of Sugar Daddy the fuzzed-out, blues rock theme song to the HBO drama Vinyl, and the promise of a new album by Sturgill Simpson. Though I enjoyed the traditional country sound of High Top Mountain, I was blown away by the more unconventional, psychedelic and intoxicating sound of Metamodern Sounds In Country Music. Not a week has gone by that I haven't listened to the album, and I was fortunate enough to see him play a couple of gigs in London last year. If Brace For Impact (Live A Little) is anything to go by then A Sailor's Guide To Earth sounds as if it will be more rock n' roll than his previous works, yet still unmistakably country. Using Promise as a reference, his version of the Nirvana song In Bloom should be very interesting. Both the quote above and video below give me some reassurance that he hasn't given up the cosmic journey undertaken on Metamodern Sounds, at least not yet. Having always described his albums as conceptual I'm eager to hear, and feel what this one is about. A Sailor's Guide To Earth is due for release on April 15th. Ode Pt. 2 is provisionally a think-piece on The Human Condition, Kanye West and Hip-Hop in 2016 and will be posted soon. I anticipate it will be wildly contradictory and if not enlightening, I hope at the very least entertaining. The poem Ode by Arthur O'Shaughnessy serves as the title and backdrop of these posts.